Forward Madison FC has signed 26-year-old Florida native Brian Sylvestre, who becomes the team's first goalkeeper. Sylvestre, who started 12 matches in 2015 for Major League Soccer's Philadelphia Union, brings top-level quality and experience to Madison. According to Head Coach Daryl Shore, Sylvestre has the ability to be a standout between the posts for FMFC. "Getting a goalkeeper who's played a lot of minutes as a starter in both MLS and the lower leagues, we feel like Brian's going to be a huge asset for us in goal," Shore said. "He's a very good shot-stopper, he commands his box very well and even though he's only 26 years old he brings a veteran, calming presence to the field." Sylvestre grew up in Florida, but moved to Canada after high school to join the Vancouver Whitecaps residency program. After persevering through several injuries, he got his big break in 2014 when he put on a spectacular performance against the Philadelphia Union. The Union signed him on loan the next year, and he became a starter for the team. 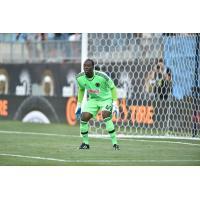 "When their 'keepers went down, they called me in and gave me my shot," Sylvestre said. "I had a great little run in MLS for a bit. Played really well, went back to North Carolina (in the second division), and I just kept getting my games." Sylvestre met Shore during his youth career in Florida, and the two have kept in contact over the years. Now, the pair will team up for Forward Madison's inaugural season. "I'm not afraid of anything, I'm very competitive and I always put myself at the highest standard," Sylvestre said. "I'm going to show my best every single game and hopefully we're going to bring something special to Madison." Brian's signing will be confirmed pending league and federation approval. Get tickets to see Brian in Forward Madison FC's inaugural season at https://www.forwardmadisonfc.com/tickets.